The National Junior Swim League ("JSL") is based on a similar overall structure to the National Arena Swimming League ("NASL"). However, the JSL is specifically for younger swimmers with swimmers divided into age groups; 10&Under, 11&Under and 12&Under. As a club we compete in the M11 League. The Club uses JSL as an opportunity to get as many swimmers as possible involved in swimming as a team. The Club enters an A Team and B Team into this event. 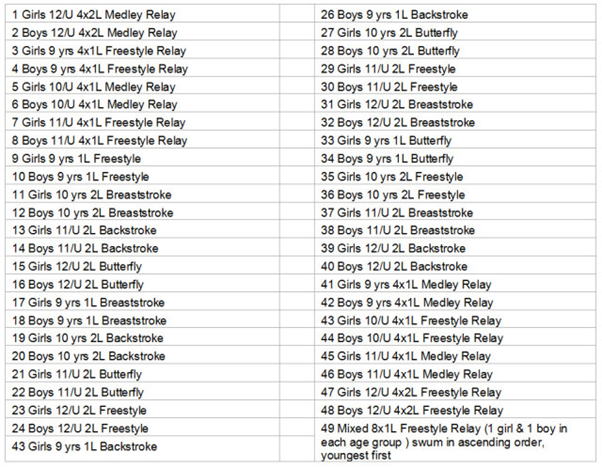 The A Team swims in the Premier Division of the M11 League and selections will be made based on the fastest swimmers in each age group. The B team competes in Division 1 of the M11 League and we look to involve as many swimmers as possible across the three rounds meaning the make-up of the team changes completely from one round to the next. The Junior Swim League galas take place in April, May and June in each season. Similar to the NASL the JSL is the clubs biggest team event of each season and if selected swimmers are expected to be available to compete for the team.